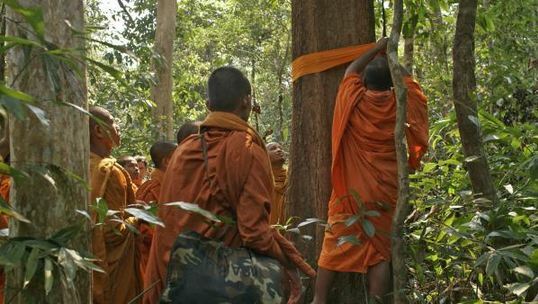 In the forest, a group of monks tie saffron cloth around tree trunks while chanting a centuries-old Buddhist chant still relevant today. It is a chant of compassion, pity, and love and of a divinity that does not exist in a temple but in the forests that the monks and the villagers both call their home. Image by Kalyanee Mam. Cambodia, 2014. After journeying seven hours on a bus from the capital city of Phnom Penh, Venerable But Buntenh and a band of 16 young, social-media savvy dissident monks pile onto the back of a pick-up truck and wind their way on a bumpy dirt road to Areng Valley, nestled in the Cardamom Mountain range in southwest Cambodia. The young monks arm themselves with cameras and video recorders, snapping shots along the way, their bright saffron robes flapping in the wind. Kalyanee Mam reports for the Pulitzer Center on Cambodian monks’ mission to stop the imminent construction of the Stung Cheay Areng dam, a project the government of Cambodian has contracted to Sinohydro Corporation, China’s largest hydropower company.